Abstract: The author probed into dilemmas encountered by social sports specialty development and put forward ideas for reform. Dilemmas encountered by social sports specialty development are inclusive of some intrinsic fac-tors, also closely related to such specialties as sports economy, sports management and leisure sports; it is because of the coexistence of these 4 specialties that has resulted in such a current situation as specialty crossing, course sameness and employment post similarity. To break through dilemmas in social sports specialty development, it is necessary to reform these 4 specialties in a coordinated way. 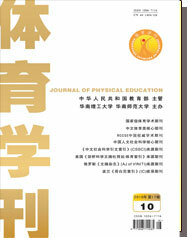 The author put forward such ideas for reform as to merge social sports with leisure sports specialty, as well as to merge sports economy with sports management spe-cialty, and demonstrated reasons for merging and measures for reform after merging in terms of cultivation objec-tive, curriculum content, practice link, qualification certificate and student employment etc.